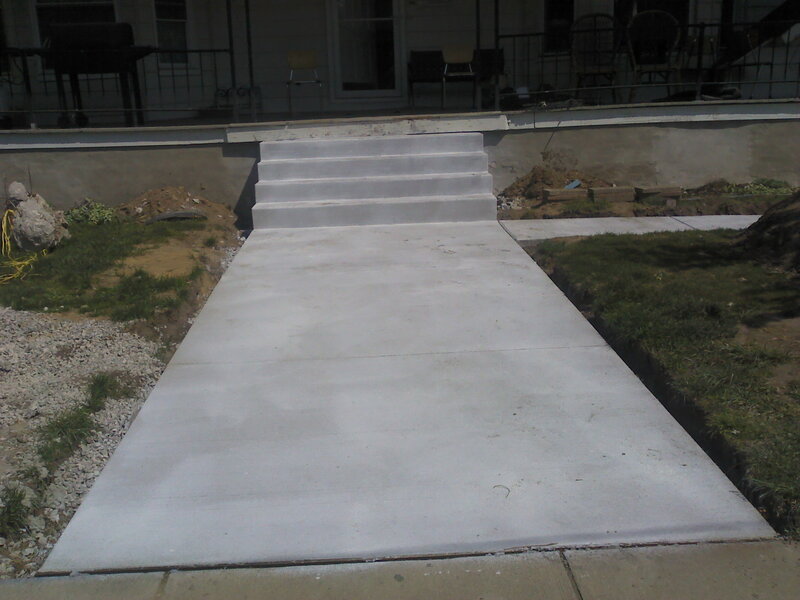 I hope many of you have had a chance to see the new steps put in by Bill H. and Stevenson Building and Supply. We are so very grateful for them. Of course I have had more than just an opportunity to look at them. I have walked up and down on them. I have sat on them. I have even dropped things on them and I can tell you that they are solid. However the pretty white color that makes them look so new and beautiful is deceiving. While it is great to spray the new concrete with this beautiful sealer, it is not the sealer that gives the stairs their strength and makes them sturdy and safe. If the concrete under the white sealer is bad, the stairs are going to crumble. It is the quality of the concrete that determines whether the steps and walkways will endure the tests of time, weather and abuse that is sure to come. It is Jesus that gives our Christian lives authority. This is the authority that gives substance to all the things that we do. Without it all the doings collapse under the weight of eternity just as our steps and walkways would collapse if the concrete was faulty, or if say we tried to build the steps from sand or clay. However there is a reason that Bill sprayed a 5 gallon bucket of concrete sealer on his work. I don’t want you to think that all the things that we are called to do as followers of Christ are meaningless. If we do not take care to seal our relationship with Christ, over time we will be worn down. This is perhaps more insidious and destructive than the collapse of poorly constructed steps. It begins with the best intentions and then is slowly worn away because we accepted Christ into our lives and made him the base of our steps but then we don’t follow his guidance. We do not apply the sealing works of His Word, of prayer, of fellowship with other believers, of love, of discipline. Without these we will soon succumb to the lies of the enemy and he will destroy our effectiveness as children of God. It is hard to believe that it has been a year since we moved into The Lewis House and began our lives as full-time urban missionaries. This span of 365+ days has been at once nothing like I had imagined it to be and more than I had ever thought it would be. As I sit here at my computer and type this out I know without a doubt that the man who left the restaurant business three years ago could not have stood through the last year. God has brought through an amazing process to bring me here to The Lewis House. It would be redundant to take you on that journey with me again. You would be better served reading my lovely wife’s article “The Journey to the Mission”. I re-blogged it last month. More important than the earthly provision is the spiritual transformation that I have experienced. Without the times of want Paul might not have recognized the transformation that he had undergone. Without the times of plenty he could not have appreciated the Spiritual transformation that engaged his contentment in the times of wanting. We should not assume that this transformation was completed miraculously on the road to Damascus. It was a process that passed Paul through the Arabian wilderness, the narrow streets and prickly political paths of Jerusalem, the urbane halls of Asia Minor and the intellectual collections of Greece. It was a transformation that continued until he was called home on a fateful day in Rome. It is a process that we all undergo and one that includes times of plenty and times of want. It includes times of great joy and times of crushing grief. Each of us has a path to follow and every path is a little different but it is all about one Spirit and that is our Lord and Savior Jesus Christ. It is into his wonderful likeness that we are being changed. Like Paul I am so thankful to all of you who have come along side of us and answered God’s call to support us in our ministry. (Philippians 4:10) We have been so blessed by the generosity of God’s people. Even as you develop in your lives “ever increasing glory” you enable us to do the things that God has called us to do and to continue our transformation spreading the light of His Glory to our neighbors.